Here, we will walk you through how to get started with Skafos Quickstart models, adding the right libraries, importing additional data, and creating labels so you can customize the model to suit your use case. Here at Skafos.ai, one thing we are passionate about is making machine learning more accessible to non-data scientists. Machine learning is not magic — it is simply a tool, and it is one that we should all feel empowered to use. But…what if you’ve never used ML before? Where do you even begin? It is exciting to think and talk about using the latest convolutional neural network to power your next app, but…what if you aren’t even sure what that is, or what data to use to get started? In building our platform, we’ve been fortunate to have feedback from a group of phenomenally talented iOS developers. The feedback we’ve consistently gotten is: “I want to use ML, but I don’t know what I’m doing. I know I need to combine data to build a model but I don’t even know where to start.” To be sure, data ingestion and wrangling is a huge challenge when it comes to successfully leveraging machine learning. A model is only as good as the data that goes into it, and for those of us who aren’t fluent in building machine learning models, even knowing where to begin can be daunting. In this tutorial, I am going to walk you through how to add data to an existing model, retrain it, and deliver the output to your phone, all using Skafos. Though seasoned data scientists are welcome to read and follow along, this tutorial is not designed for you. Are you an iOS developer who just needs to get started and understand how to iterate and train a model? Read on. As part of the Skafos.ai platform, we’ve included a number of different Quickstart models and app templates to get you up and running quickly. Our CEO, Michael Prichard, has created a video tutorial of this process to show you how to get an ML-powered app up and running in minutes. In this tutorial, he demonstrates our Quickstart Image Classifier, which identifies cats and dogs. The first thing we need to do is create a Quickstart project using a pre-built Image Classifier model. To do this, you can either follow along with Michael’s video or follow our Quickstart Guide for iOS developers. If you follow the Quickstart guide, be sure to choose Image Classifier from the list of available projects. At the completion of either the video or the Quickstart guide, you should have the Skafos Image classification app on your phone, and it will identify either cats or dogs. Once you’ve created this project, you can access it upon login from the “All Projects” page. Click on the name of the project in your dashboard. This will take you to the main project page. From there, click the Launch JupyterLab button. This will spin up a Skafos JupyterLab instance, and take you to the code that was used to build the cats + dogs model. From there, we will modify it to include rabbits. When you first launch the JLab, you will see the following files in the left hand pane. Double click image_classifier.ipynb to open it. Note that this code was forked from github.com/skafos/TuriImageClassifier, but this copy is now yours. Now, you can run the first three cells in the notebook, in order, to install these needed libraries, import them, and initialize an instance of the Skafos SDK. The first thing that we need to do to change our model from dogs + cats to dogs + cats + rabbits is to include some photos of rabbits in the training data. In the existing code, we pull zipped data from a public S3 bucket, and unzip it. This creates a copy of the PetImages data in this JLab environment, with two subfolders, Cats and Dogs. These are filled with images of (wait for it! ), cats and dogs respectively. The Google Open Images Data Set is an excellent place to find data for training both image classification and object detection models. The rabbit images that I am using in this example came from this source. A helpful open source repo for pulling data from Google Open Images is the OIDv4 Toolkit. You are welcome to use other open source images as you wish, or take your own. This is one example. For any image classifier, once you have identified a source of photos, you will need a place to put them. I recommend S3 buckets. For purposes of this tutorial, I have created a public S3 bucket with a subset of the Google Open Images rabbit photos, as well as a subset of the Cats and Dogs available in the original PetImages data set. This S3 bucket is included in the code below, and you are welcome to pull data from it if you wish. Note that only a very small subset of the images is included for purposes of this tutorial. More images will improve model performance. 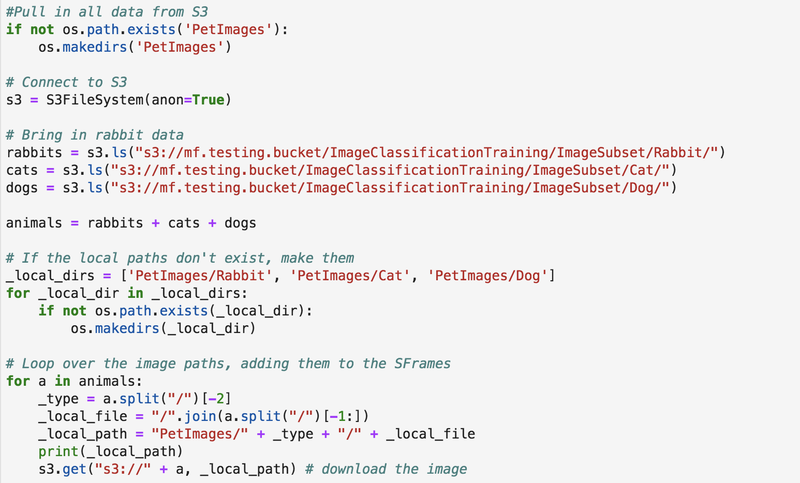 This code will pull images of dogs, cats, and rabbits from the listed S3 bucket, and place them in the appropriate sub-directories of PetImages. After inserting this code, execute this cell. I want to pause here and note that you could do this with images other than rabbits, or add a fourth category. You could also eliminate dogs and cats all together and use three different animals (horses, cows, chickens?). The main point is that so far, all we have done is taken previously curated images and downloaded them to three different sub-directories. That’s it. You’ve got this. This line of code loads all of the images into a TuriCreate SFrame. The second line of this code block is the one that assigns labels to each image, and does it based on the directory each image is in. This will make sure the rabbits are actually labeled as rabbits, because this label is the target for training. The final line of this cell randomly partitions the data into what will be used for training (80%), and what will be held out for model testing. It can be left as is, and you can go ahead and run this cell. For more information about train/test splits, this is a useful introduction. now builds a model that identifies dogs, cats, and rabbits. This is one of the excellent features of the TuriCreate framework; it simplifies the process of going from a binary to multi-class image detection. Once your model is done (and this may take a bit of time, depending on the number of images you choose to include), uncomment and execute the final cell, to save your model to Skafos and automatically push it to your app. Hopefully this has given you a sense of how to take an example model and data, make adjustments, and retrain it to give a different result. Machine learning is new, but it doesn’t have to be hard or confusing. We’d love to have you join our Slack community and Skafos subreddit to continue the conversation.